That leader, of course, is George Hawkins (who else? ), general manager and CEO of the District of Columbia Water and Sewer Authority (DC Water). And the plan is Blue Drop. For me, developing a “business” model for a public agency that can generate significant revenue from the technology, skills, and experience that have been developed at ratepayer expense is a critical element of a structural response to the inadequacies of the historic public utility model. I do think we have a very special moment to do something unique at DC Water and have the potential of providing real relief to our ratepayers while simultaneously advancing this industry. When much-needed services can’t be adequately fulfilled by smaller utilities with tight budgets, shared services can fill the gaps. Hawkins also noted that DC Water isn’t the first utility to do this. That distinction belongs to Clean Water Services outside of Portland, OR, and its nonprofit offshoot called the Clean Water Institute, which provides expertise in resource recovery, watershed management, and organization strategies. It’s a model that can and should be duplicated whenever possible, wherever leading-edge utilities can package their abilities to benefit their own ratepayers, their peers in water and wastewater management, and the communities and environments they look after. Blue Drop does this through the following goods and services. Bloom is a Class A U.S. EPA-certified Exceptional Quality (EQ) biosolid, suitable for commercial soil blending, landscaping, and urban gardening, created through the Cambi thermal hydrolysis process (THP). DC Water was the first North American utility to adopt this brand of THP (from Cambi, a Norwegian company), which “pressure cooks” sludge to generate higher biogas yields for cogeneration while decreasing sludge volume and hauling costs. Importantly for Blue Drop, the pathogen-free byproduct is a nutrient-rich, moisture-retaining, and weed-resistant soil amendment. Bloom also saves energy and reduces carbon emissions better than conventional petroleum-based fertilizers. Blue Drop offers four types of peer-to-peer consulting services. The first, stakeholder engagement, counsels utilities on how to “Seize an emotional connection with your customers.” As utilities are forced to raise rates and close roads to fix failing infrastructure, public support becomes increasingly important and yet harder to earn. Winning it starts with a plan and is carried out through caring and responsive communication, both from afar (e.g., social media, telephone) and in person through community events. DC Water launched its very successful community outreach campaign in 2010, and if you’ve ever had the chance to hear George Hawkins speak, you understand effective utility communication. While it starts at the top (à la Hawkins), utility leadership is critical throughout the workforce. 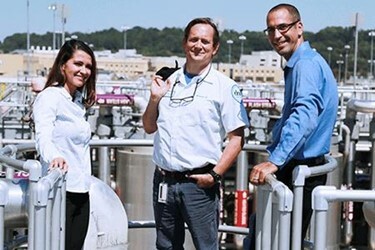 Attracting and inspiring employees to serve what DC Water calls the “mission of public health and environmental protection,” in addition to earning support from regulators and political leaders, is an asset that Blue Drop, by leaning on DC Water’s own experience, can help others to cultivate. The experience and organizational know-how that allows DC Water to efficiently manage 600 vehicles has also equipped Blue Drop to consult on fleet operations, with instruction for acquisition and disposal, program management, and integration of fleet technology. Finally, and perhaps most critically, Blue Drop offers consulting on emergency management/security services, which prepares utilities for accidents, natural disasters, and terrorist attacks. Serving 15 million or so people in and around the nation’s capital, DC Water is obviously well versed on the topic. Because DC Water works at such a huge scale and with abundant resources — uncommon among its peers — Blue Drop can extend those resources to other utilities. Fleet management and emergency response services are available, as are technology solutions and third-party applications. When much-needed services can’t be adequately fulfilled by smaller utilities with tight budgets, shared services can fill the gaps. And, sometimes, it’s simply cheaper to lease than to own. DC Water has always been ahead of the pack, but now that leadership position is being used to benefit and inspire fellow utilities. Great leaders make others great.